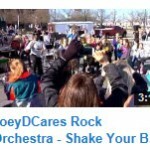 Check out the JoeyDCares Rock Orchestra’s YouTube channel! You can see highlights from our recent performances, as well as some older performances and events. Check out some fun videos of JDCRO “rehearsing.” The How It All Began video was filmed in 2011 and gives a great look at how the JoeyDCares Rock Orchestra got started!